If you haven’t noticed, blueberry season is in full swing. If you’re like me, you may have more blueberries than you can possibly consume. 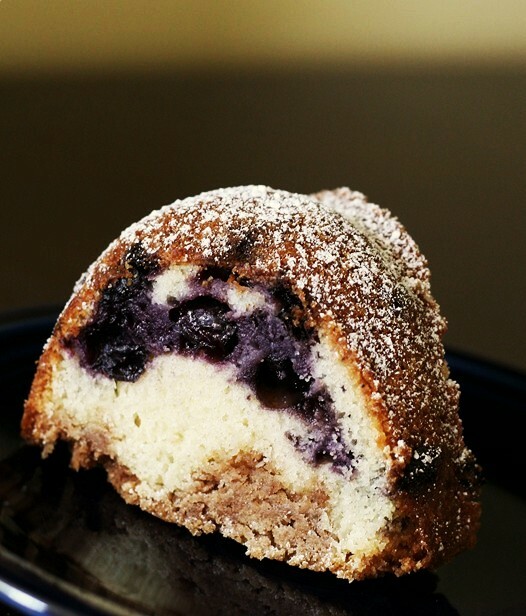 No fear, I have an awesome blueberry buckle coffee cake recipe for you! What is the difference between a buckle and a coffee cake? I asked some of my Twitter friends this very question and two very knowledgeable friends replied with varied responses. Lorna Yee of The Cookbook Chronicles had this to say, “I always think of buckle as a lot more fruit-heavy than any coffee cake would be because it’s in the “grunt/crumble” category”. Kim O’Donnell of True/Slant and former food writer for the WashingtonPost.com replied suggesting “if it had some type of fruit in it I suppose it would be some version of a buckle.” So there you have it, two expert opinions on what makes it a buckle and what makes it a coffee cake. I decided my recipe is a Buckle Coffee Cake. There, I’ve covered my bases. What I like about this recipe is the brown sugar crumb crust which adds texture, flavor, and sends this coffee cake into a league of its own. Preparing it in a bundt pan also is nice because you can garnish it with powdered sugar and have the crumb crust actually be layered on the bottom. However you decide to bake it, I present to you the recipe. Enjoy! Preheat oven to 350 degrees. Grease 8×8 square pan or bundt pan with non stick spray. In a medium mixing bowl, cream butter and sugar for 3-4 minutes until light in color and creamy. Add egg, and vanilla and cream for an additional 2 minutes. Add salt, baking powder, and all purpose flour and mix on med.-low speed adding the buttermilk in a steady stream. Mix batter until everything is fully incorporated, approx. 3-5 minutes. Batter will be nice and thick. 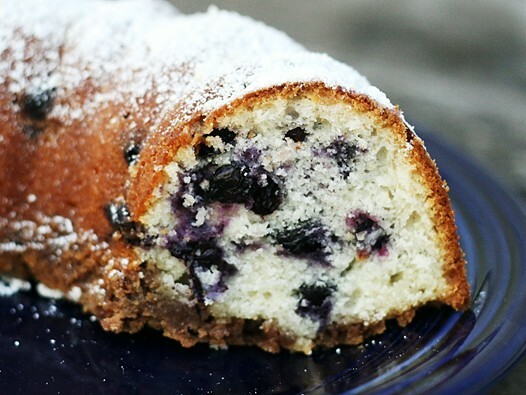 Fold in fresh blueberries and pour batter into pan. Set aside. 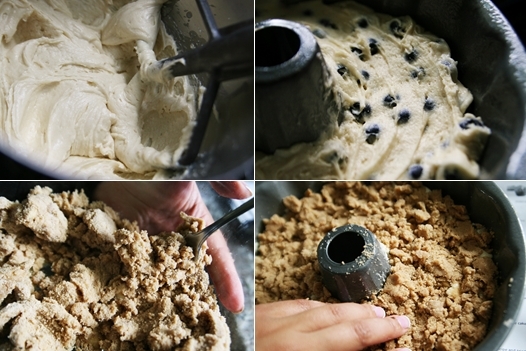 In a food processor or by hand, mix brown sugar, flour, cinnamon, and cold butter until the mixture is crumbly. If mixing by hand, just use your fingertips or the back of a fork. If you are using a food processor just pulsate everything until you get a crumb mixture. Add crumb topping mixture to the cake pan and gently press everything down. Bake in the oven for 60 minutes or until done. Remove from oven and let it sit for 8 minutes and invert it onto a plate. Garnish with sifted powdered sugar. Enjoy! *For a more traditional looking coffee cake, see this adapted version using sour cream. 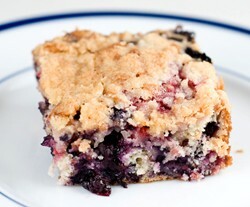 For another great Blueberry Raspberry Buckle recipe by Michael Natkin of Herbivoracious.com, click on the picture below. These are delicious! I made a few changes. I used lemon extract in the place of vanilla and substituted almond milk for the milk/ buttermilk. I looked everywhere for a recipe for my fresh blueberries. This was perfect. Thank you. I tried this recipe today and I have to tell you it was awesome! I made it in a bundt pan so the topping was on the bottom. 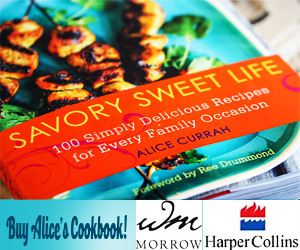 Absolutely delish – glad I stumbled upon this recipe and your blog. My husband was also glad 🙂 – thanks! Glad you liked it Randi! I made this last night and it is a really nice cake. This recipe goes into my keeper files. I’m glad that there is not so much butter in it. makes me feel less guilty. The Blueberry Buckle is a WINNER!! I probably won’t use my precious 1 -1/2 homegrown cup of blueberries any other way again! It’s on my countertop and disappearing every time someone walks by!